Do you have to take your dog to the groomer to get out the mats? Wouldn’t it be nice if you could do this yourself, instead of having to pay the dog groomer? The following video shows you which dog grooming tools you really need to brush your dog and get rid of the mats. 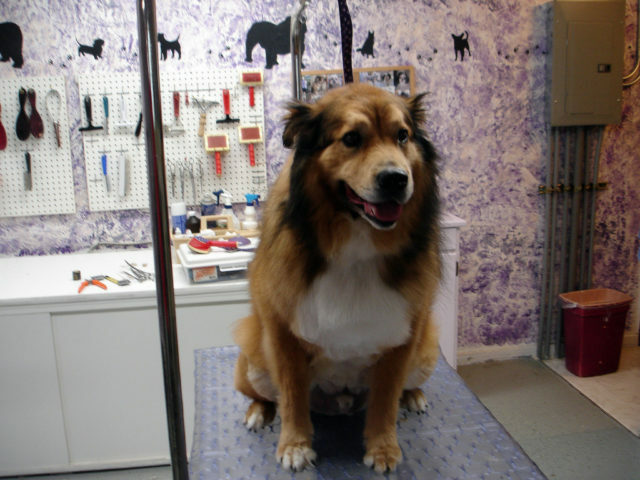 Plus, you’ll see how to get out mats and the importance of using different brushes and combs when grooming your dog. Who knows, you may never have to go to the dog groomer again! If you’re not ready to go all out and take on the full head-to-toe grooming sessions yourself just yet, then the Furminator is a great dog grooming tool that will get you by between trips to the dog groomers. Find yourself too short on cash to take your dog to the groomer? Want to lengthen the time between visits to the groomer? Trim your dog’s nails – Try to make it fun for your dog, and only do a few nails at a time if that’s all your dog will sit still for. Brush your dog – Brush your dog weekly to keep his coat healthy, and to keep the fur from flying everywhere in your house. Bathe your dog – If you (or your dog) don’t enjoy bath time, try a waterless foaming dog shampoo. Keep your dog’s ears clean – An ounce of prevention can eliminate costly vet bills to treat an ear infection.